Mikkel Andresen runs in his fifth try. 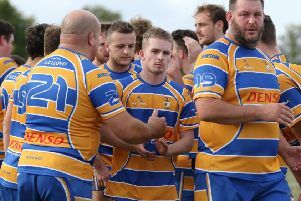 Andresen kick-started Kenilworth’s ten-try victory in the second minute, when the powerful back-rower was put into space just outside Rugby St Andrews’ 22 for a try converted by winger Josh Emery. Kenilworth continued to pressurise the visitors and their efforts were rewarded after nine minutes with a turnover on half-way. The ball made its way to Andresen who showed both his power and pace, handing off tackles on his way to the line. It took less than five minutes for Kenilworth to add a third, this time courtesy of a driving maul following a five-metre lineout. Jack Read was at the back of the maul and touched down to score his first senior try. 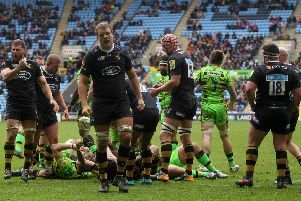 The conversion from Emery extended his side’s lead to 19 points. Despite the early deficit, Rugby St Andrews showed their attacking intent and scored their first try of the match 20 minutes in. Good hands saw the ball spread wide and into the arms of former Kenilworth player Will Morgan who dived over the line before adding the extras. Morgan then added to his points tally with a penalty to close the gap to ten points. With just over half an hour gone Kenilworth sealed the bonus point when Andresen scythed through the defence to touch down by the posts. Emery’s conversion sailed through the uprights for a 26-10 lead. St Andrews cut the deficit on the stroke of half-time with a try in the right-hand corner, again converted by Morgan. The second half began in the same way as the first with another try from Andresen who once again showed his pace to race clear and touch down. Emery added the extras. Kenilworth’s sixth try of the afternoon came from a Rugby St Andrews knock-on which allowed second-row Jonny Openshaw to collect the loose ball in space. Openshaw then offloaded to Gareth Renowden and the fly-half sprinted in down the line. The two points from the boot of Emery gave the hosts a 40-7 lead with just over 30 minutes remaining. The home side added to their tally three minutes later when a great carry from Tom Naismith, playing his first match at outside-centre, took Kenilworth over the gain line. Quick thinking from the number 13 saw him offload to Andresen who crossed for his fifth of the match, with Emery again adding the extras. Ed Rogers then added his name to the scoresheet, showing good pace and footwork to jink through the defence and race over the line from the 22. Emery made no mistake with the conversion to take his side’s tally up to 57. With 20 minutes remaining, Rugby St Andrews crossed for their third try, once again making the most of good field position to spread the ball wide in the 22 and cross in the corner. Kenilworth continued to press and a ninth try came when Renowden spotted a gap in the visitors’ defence to touch down by the posts. Emery then went from place-kicker to tryscorer after some slick passing released the winger into space on the left for a sprint to the line.